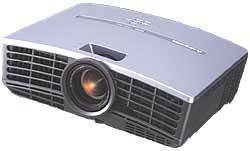 Mitsubishi HC3000 home theater projector is a DLP projector with BrilliantColor technology by utilizing TI DarkChip2 DDP3020 chip from Texas Instruments. Mitsubishi HC3000 has a 720p native resolution (1280 x 768) which is HDTV capable. HC3000 specifications include contrast ratio of 4000:1, 15:9 aspect ratio, lamp life of up to 3000 hours and low noise level of 25 dBA, and measures 12.2 inches wide by 3.9 inches high by 9.6 inches deep, and weighs a mere 6.4 lbs. Smarthouse reviewed Mitsubishi HC3000 projector and concluded that “if we had to choose, we’d take a better visual dynamic range over greater sharpness when it comes to movie viewing. Even with its occasional rainbow effect problems, the HC3000 still does enough to justify its extra cost over its main LCD rivals – as well as comparing well with its main DLP rival, the BenQ PE7700.